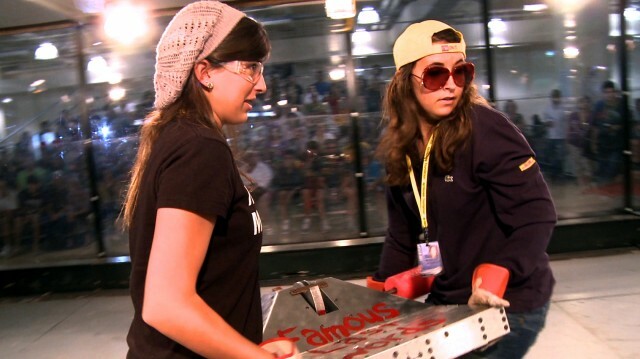 Girls taking part in competitive high school robotics in a big way. A recent post by ED Lynch highlighted the world of competitive high school robotics. Mr. Lynch says, “Some kids play football in school. Other kids build bone-crushing combat robots with the expressed purpose of dismembering competing bots in thrilling caged-death matches.” A new documentary called Bots High by Joey Daoud follows three teams of high school robotics geeks who build and battle their way to a national robotics competition in Miami. We think it’s cool. See some of the action below. The old cup prank never seems to die. It involves carefully placing half-filled cups of water over an entire area making it impassable and a major pain to clean up. This time of year, students all over the country are pulling this prank on their schools, and their roommates. 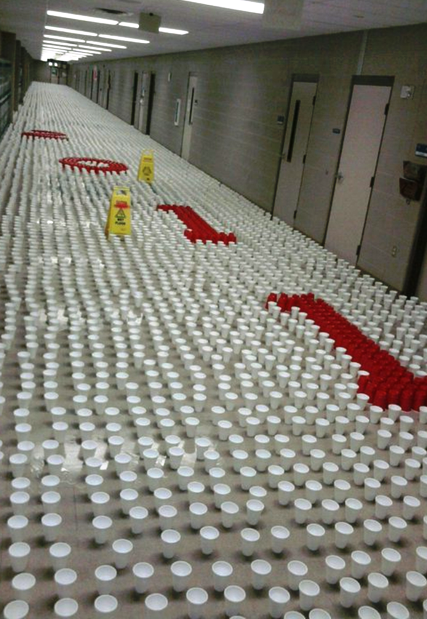 It’s one of the best student pranks ever, unless you are a janitor. Not sure where this one happened, but apparently it was a high school. Said to be done at a high school. Unknown school. There is no question that Gen Y struggles with real issues and needs a support network where they can share their own stories of hope and encouragement with their peers. The “We Can Help Us” campaign, created in conjunction with DDB New York, The Ad Council and SAMHSA (The Substance Abuse and Mental Health Services Administration), is a peer-to-peer-based effort designed to help youth cope with tough times through the power of sharing real stories. This effort was chosen by Campus Media Group for its annual College Newspaper PSA Program and will be running in campus newspapers and on newspaper websites over the next several months. We Can Help Us is based on the following insights that are essential to understanding and reaching Gen Y. The Pew Internet & American Life Project affirmed this in 2007 with its first report on teens as content creators. With the ease of recording video with phones, the iPod Touch and Flip Video Cameras and with Facebook as a primary method of sharing, we can assume that content creation is only increasing. This generation has also grown up in a confessional culture fueled by reality TV and the candidness of personal sharing online. We Can Help Us taps into these traits but focuses on stories from youth describing how they actually overcame a tough time versus just “confessing” without seeking help. A theme uncovered by PortiCo Research shows that youth often avoid telling people in positions of authority about their problems because that authority figure may feel obligated to “do something” about the problem by reporting it or intervening in ways that will be embarrassing or further complicate things. 2008 research from Ypulse, ISIS, Peanut Labs and Youth Noise reveal that health sites are most helpful when they include accurate, accessible information where users can obtain personal support from both peers and professionals. The We Can Help Us campaign is hosted on ReachOut.com and taps into Gen Y’s natural desire to help each other while providing links to professional support, peer stories, and factsheets written by youth and edited by professionals. In spite of the down economy, war and environmental disasters, this generation views its glass as half-full. Recent Pew data show that 41% of Gen Yers are satisfied with how things are going, compared with 26% of older people. By echoing their feeling that things will get better, We Can Help Us ties into the optimism that seems to be inherent with this generation. College newspaper readership studies have shown that more than three-quarters of college students read their college newspaper over the past month. Although it can vary from school to school, colleges with daily editions can see even higher readership. Free news and information specific to campus life and the ease of grabbing one off the newsstand between classes make newspapers an effective campus-based media channel for delivering important and, in this case, life-saving messaging.